As the shadows fell and the world turned, I watched the stars – in their intriguing constellations – move across the cold skies of a late winter’s March night. I made my observations over a period of hours, stepping outside the door of the woodstove-warmed cabin to stand and stare into the heavens. I was feeling satisfied, full of supper. 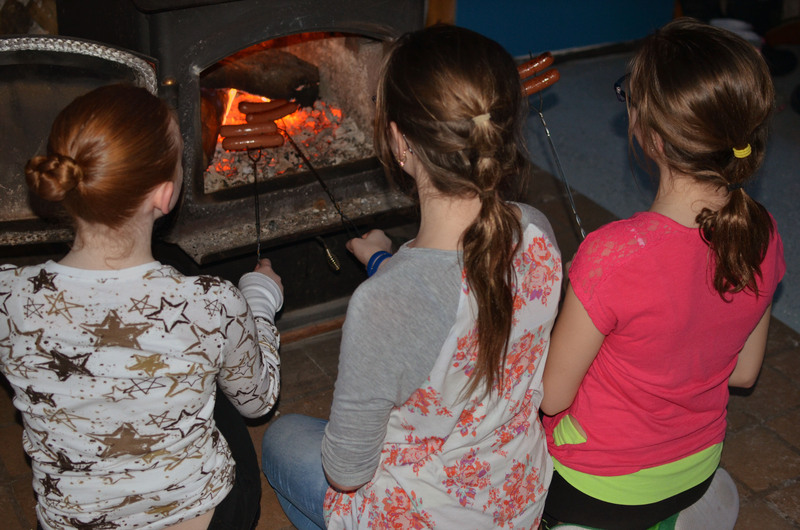 We cooked some bratwurst and hot dogs over the woodstove fire, and we warmed some chili in a cast-iron Dutch oven on top. I don’t know what it is, but there’s always something earthy and good about eating chili at a wooden table inside a cabin. For the full effect, it’s best to eat the chili with a wooden spoon like Tuco and Angel Eyes did in The Good, the Bad and the Ugly. For some reason, it always tastes better that way. The later it got, the more the sounds from the black-topped highway – like a blaring ambulance siren and the whirring of the wheels of fully loaded logging trucks rolling east – died down. 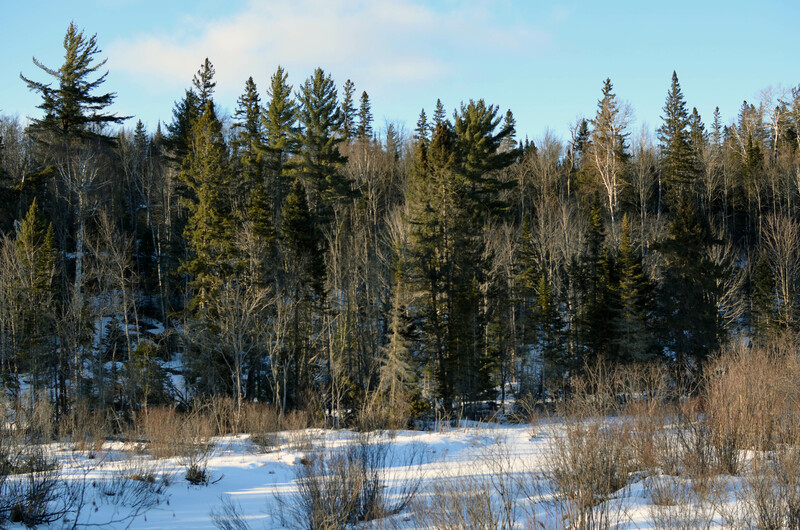 This surrendered the night to the sounds contained within the tall maples and pines that stood along the ice-locked riverbank. On other nights, these sounds had included the faint hooting of a great horned owl, the yipping of coyotes and my whistling in hopes of contacting a little saw-whet owl that was no doubt hiding amid the dense forest, along the pathway, down by the river. By midnight, the Big Dipper had moved into place almost directly overhead, a good distance from where it had been earlier in the evening. I followed an imaginary line from its leading edge straight out into the blackness to the bright shine of the North Star – which is the last star on the handle of the Little Dipper. The big and little dippers are each part of bear-shaped constellations called Ursa Major (the Great Bear) and Ursa Minor (the Lesser Bear), respectively. Not far away in the sky was the “W” marking Cassiopeia, named for the vain queen of the same name from Greek mythology. To humiliate the queen, Neptune placed her in the sky on her throne with her head nearest to Polaris – the North Star. Doing this would force the queen to spend half of every night upside down. It was much colder, the sky clearer. As the nighttime turned into early morning, we inched closer toward 2 a.m. – the moment when the minute hand on the clock would spin ahead to 3 a.m. and we all would go tumbling, falling forward toward spring. On this trip outside the cabin, an icy blue curtain had dropped over everything. The snow crunched loudly as my boots moved through the snow. Once I stopped walking, there was a deep, penetrating silence. American composer John Cage said there is no such thing as silence. He composed a controversial piece of music called “Four Thirty-Three,” which refers to the length of the music. Cage composed the piece in 1952. At a performance hall in Woodstock, New York that same year, pianist David Tudor lifted the lid of his piano and sat for 4 minutes, 33 seconds without playing anything. From as far back as 1897, pieces of music had contained phrases with blank measures, but nothing like this. This was much the same circumstance I found myself in standing in the cold winter’s night, listening hard for what the woods would offer, enchanted by the starlight. A year before Cage wrote his ground-breaking composition, he visited an anechoic chamber at Harvard University – a specialized room sound-proofed externally and designed so the walls, ceiling and floor absorbed all the sound in the room. Cage was surprised to not find silence in the room. Cage concluded we are all making music all the time. Cage said the audience experiencing the premiere of his piece missed the point. With Cage’s intention for the piece in mind, the composition sounds different each time it is performed. My own version of “Four Thirty-Three,” performed under the glittering stars, on a chilly night in Marquette County, yielded the sounds of my heart beating, a sound in my ear as though the silence was roaring – like when you hear the “ocean” through the horn of a seashell – and what I could swear was the sound of a meteor sputtering across the black sky. Back inside the cabin, the warm orange glow of the fire still pulsed through the smoky glass on the woodstove door. On my last walk outside, a little later, the moon had risen low in the eastern sky. This time, I heard the cracking sound of a hardwood splitting from the cold. The abrupt noise came from way back in the tree stand near the cabin. Not far away – and so loud it smashed the relative quiet into a million pieces – came the yacking yelp of a gray fox. I imagined he had climbed into a tree and was saying his piece to the moon shining in third quarter. 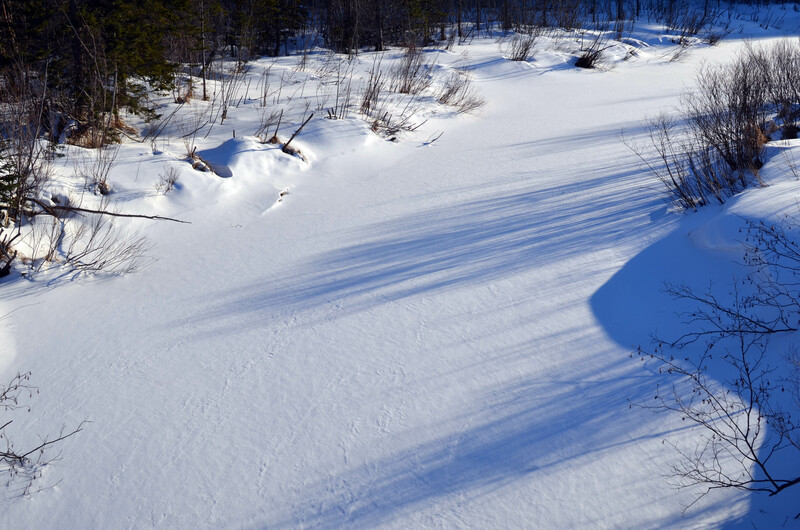 I put my hands into my jacket pockets and crunched back through the snow to the cabin door. The woodstove smoke slowly wafted from the stone-fashioned chimney. One last look around and then I ducked inside the cabin, hoping to get at least a little bit of sleep before the sun would stretch its long golden arms up over the horizon – bringing on the challenge of another day. 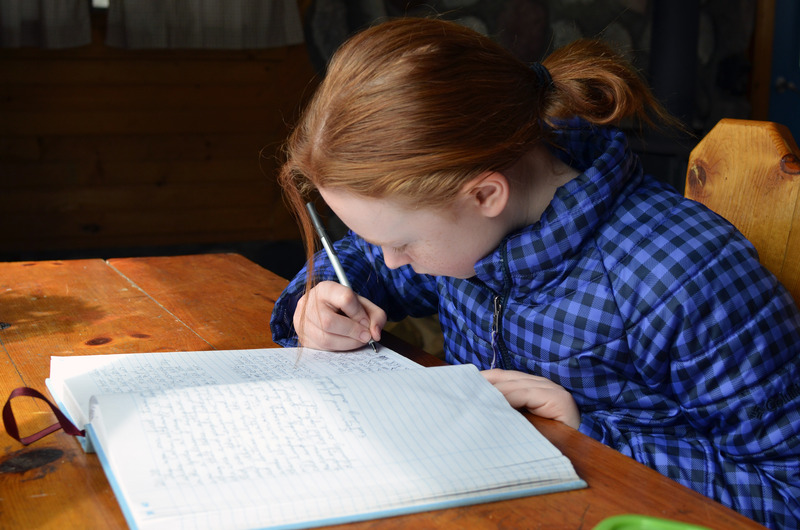 /Note to editors: Contact: John Pepin, Showcasing the DNR series editor, 906-226-1352. This story was originally issued as a DNR Outdoors North column. Accompanying photos and a text-only version of this story are available below for download. Caption information follows. Credit Michigan Department of Natural Resources, unless otherwise noted. 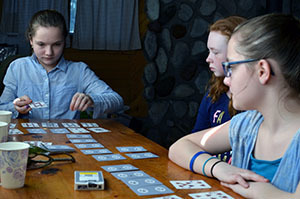 Cards: Campers engage in a card game inside the cabin on a March afternoon. Cook: Three young ladies cook their hot dogs over the woodstove fire while winter cabin camping at Van Riper State Park. Creek: Frozen bushes cast shadows across a frozen creek on a sunny March afternoon in Marquette County. Hillside: The sun finds a wooded hillside to light up on a March afternoon. 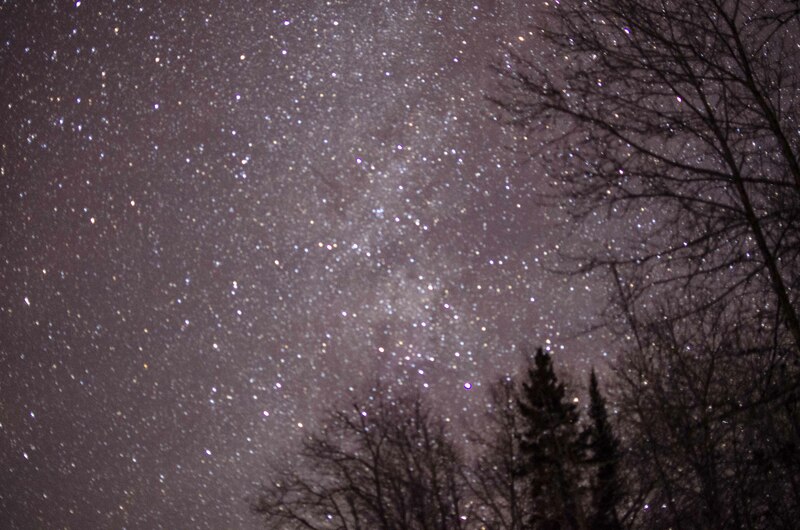 Sky: A winter night sky in the Upper Peninsula. 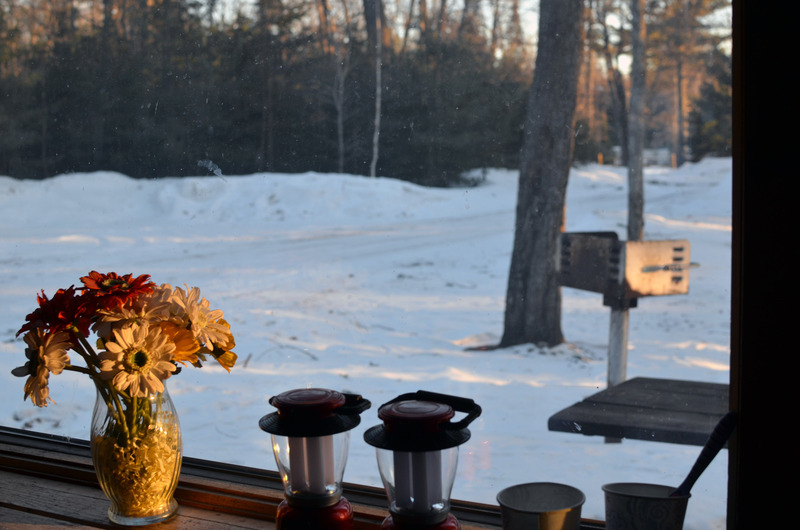 Windowsill: A look outside past the cabin windowsill.